When I read this opportunity to discuss one of the Tudor characters that I found fascinating other than Anne Boleyn I thought to myself that it is if asking to pick a star out of the sky and claim that it was more beautiful then another, next to impossible. I was so excited at the opportunity of winning a credit to apply towards one of the beautiful gowns that are sold. But, after really thinking about my favorite character I forgot all about the prize and really focused on another one of my favorite women in history. I am so pleased to have had this opportunity to share my thoughts and ideas on the young Catherine Howard. Obviously Anne Boleyn would be my first choice but with this not being an option, I most certainly have to avert to her cousin Catherine Howard. Catherine Howard was the daughter of Lord Edmund Howard and Joyce Culpeper, but more importantly was the nice of Elizabeth Howard who was the mother of Anne Boleyn. Katherine’s early life is a most crucial part to her behavior/past that would ultimately , in the opinion of some be her down fall. Catherine’s father was not a wealthy man and as a result she was sent to live with her step-grandmother the Dowager Duchess of Norfolk. The Dowager looked over several households and as a result Catherine was not given quite the education or attention a young girl would normally have been given. With the lack of attention given, Catherine had the leisure to engage in a sexual relationship with her music teacher Henry Mannox, who in later years would testify at her trial that they did indeed engage in a sexual relationship. The affair with Henry Mannox came to an end around the year 1538 when Catherine was pursued by a secretary of her step-grandmother, Francis Dereham. This affair continued with the love struck pair addressing each other as husband and wife, until 1539 when The Dowager Duchess got wind of the affair and put an end to it. I instinctively address Catherines early life because as I briefly mentioned earlier, was a key element to her downfall. After this affair her relatives knew it was time for a change. It was her uncle the Duke of Norfolk that secured her a place at court in the household of Henry the VIII’s fourth wife Anne of Cleves. In this time Henry took notice of the young, flirtatious Catherine Howard and began to pursue her. After he had his marriage with Anne of Cleves annulled, Henry immediately set his sight on marrying the young, yet beautiful Catherine. It was a brief marriage for Catherine’s young wild spirit found its delight with the kings favorite courtier Thomas Culpeper. At her trial, evidence of an affair led to her execution along with Francis Dereham and Thomas Culpeper. Catherine was executed on February 13th, 1542 and was believed to be around only seventeen years or older. Catherine Howard to me was just a young beautiful girl who became victim of a court/ king that she never really understood or grasped the dangers of being a queen. Such a young spirited woman who in my opinion wanted what every woman wants, love. It seems as though she never felt that with King Henry, but was caught up in the luxuries that come with being a favorite of the king. However Catherine made a very fatal mistake, to be a queen one must act as such and remember that this was not the house of the Dowager of Duchess where affairs with young men were disciplined by a slap on the wrist. This was the palace of his majesty the king and who will not allow any man, nor any woman make him look foolish. 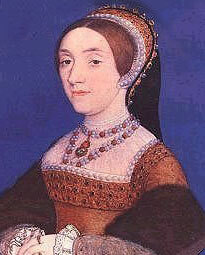 In the end Catherine lost her life and was placed in a grave close to her cousin Anne Boleyn. My heart truly fills with sadness for this young woman, and my mind fills with so many questions of what if? What if she had been more closely watched and educated in her early years, perhaps then she would not have met the same brutal fate of her cousin Anne Boleyn. What if she had never allowed Francis Dereham to come to court? What if she had never engaged with Thomas Culpeper? In the end though whenever I think of Catherine Howard I think of her as a young child laughing and running around in a garden without a care in the world, to me this is how I shall always think of her.